1st edition: Eggs & Bacon, Squid & Critiques. I hope you have an amazing Monday and a wonderful week! This is the first of many Random Monday posts where I collect some things I've liked to share with you all! It could be anything--a touch of silly, a touch of fun, delicious food, or writing advice. 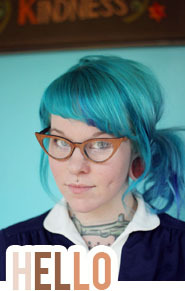 A friend of mine was looking at hair color and happened upon this amazing blogger, Kaylah, of The Dainty Squid. She's all about really neat, eclectic fashion, fun things like nail art and always has some sort of beautiful hair color. If you want a pop of something happy in your day, take a peek at her blog--you're sure to find something interesting. There's a lot going on at Crits for Water in an effort to raise money for charity: water. It's been amazing to watch the outpouring of support from the donators but also the agents, editors, and authors who are donating their time to make auctions worthwhile for writers (aside from the knowledge that they are contributing towards something huge). A FULL manuscript critique AND a 30 minute follow-up phone call! Crazy! If you have the money to donate to this charity, jump on in to help out and maybe have the opportunity to hand your manuscript over and get great feedback! Across the Universe Book Giveaway! You. Yes. You. Who are you?